Slime, it is one of the easiest and fun things to make with kids. 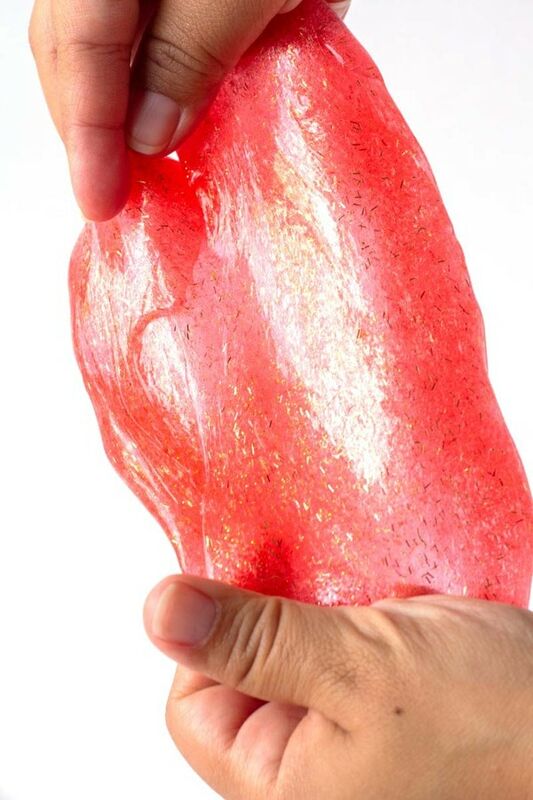 This Glitter Glue Slime needs just 3 ingredients to make it. Glitter Glue Slime has all the fun of sparkling glitter with out the mess of glitter getting everywhere. 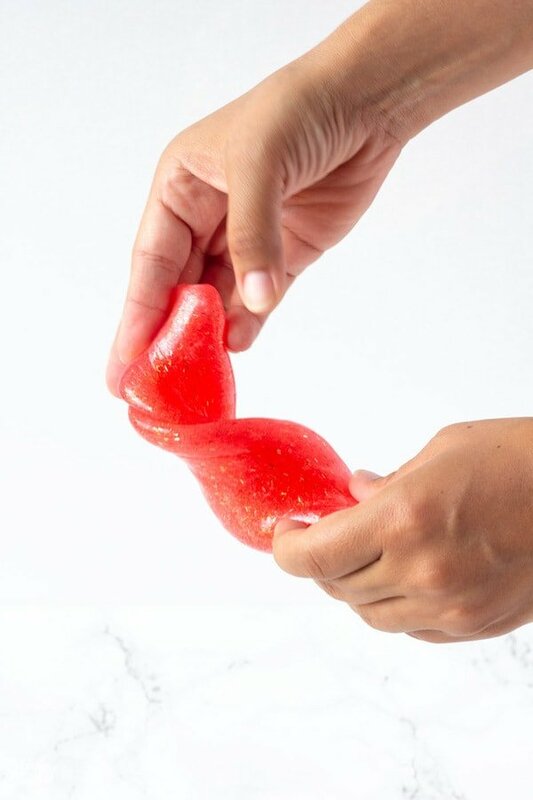 What is great about this glitter glue slime, is that the kids can basically make it on their own with just a little direction from you. With a 2 year old who thinks she is 10 in our house, that is important for us because she is in the “I do it myself stage.”. 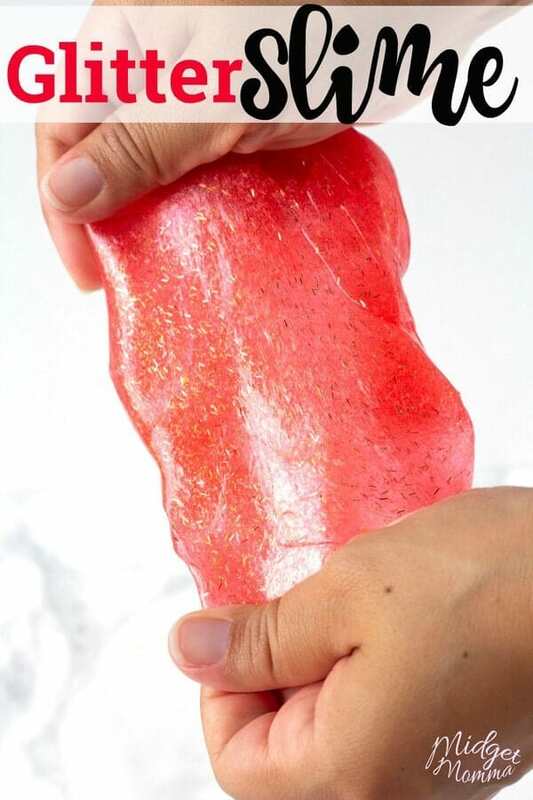 This three ingredient glitter glue slime is a no borax slime. I know many of you are concerned with kids touching chemicals, so we aim to make slime that is kid safe. There is no glitter needed (that makes a huge mess when you have little kids making slime), since you are using glitter glue. The glitter is already self contained IN the glue bottle! You can make this any color glitter slime you want to! All you have to do is buy that color glitter glue! Which also means there is no food coloring to make a mess with in this easy slime recipe! Tips for Making Amazing slime! You have to know ahead of time that you may end up using less or more saline solution, depending on the consistency you like your slime to be. You want to make sure you are adding your saline solution in slowly, because it will go from super squishy to firm quickly if you add in to much at once. There are other brands of glue aside from Elmer’s that make glitter glue, however we personally prefer Elmer’s. I find there to be a difference, that I can not really explain other then our slime comes out MUCH better when we use Elmer’s glitter glue instead of other brands we have tried. When it comes to contact solution, you can buy the “slime activator solutions”, they are just saline solution. I always just grab whatever the cheapest saline solution I can is, and I have not found any brand to be better then another. If you are looking for other 3 ingredient slime recipes, be sure to check out our glow in the dark slime! That one is so much fun for the kids, and when mine are done making it, they like to store it in mason jars as night lights in their rooms! In a medium mixing bowl pour the bottle of glitter glue in. Next add in the baking soda and mix well. Then stir in half of the contact solution and mix well. Continue adding SMALL amounts of contact solution until you get to your desired slime consistency. Take the slime out and begin kneading with both of your hands and have some glitter slime fun! Looking for more slime? 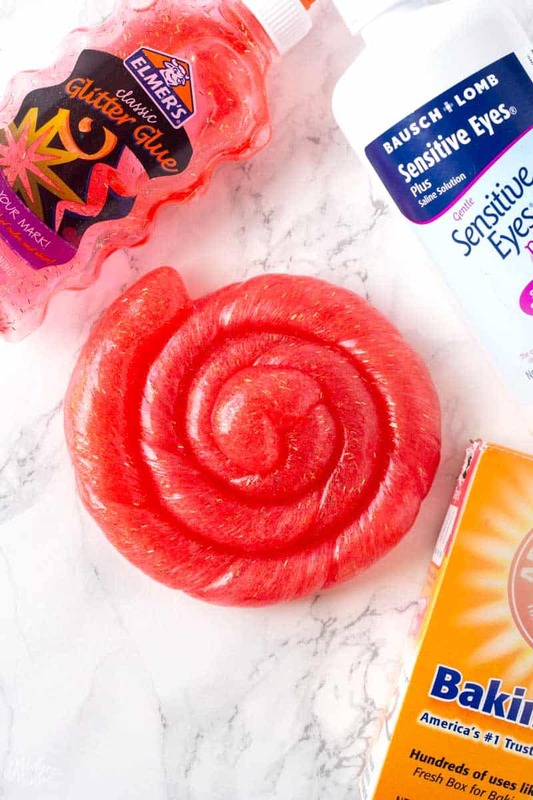 Then check out some of our other favorite slime recipes! If you are looking for more slime Recipes be sure to check out all the different ways to Make slime that we have!